Home Opinion Fr. John Flader Are there rules about what extraordinary ministers can and can’t do? Are there rules about what extraordinary ministers can and can’t do? Dear Father, In my parish there are many lay people helping distribute Communion and I sometimes wonder whether they are truly necessary. Also, the priest sometimes sits down and lets the lay Eucharistic ministers distribute Communion. Is this correct? First, the term “lay Eucharistic minister” is not correct. The Vatican’s instruction Redemptionis Sacramentum (2004) explains: “As has already been recalled, ‘the only minister who can confect the Sacrament of the Eucharist in persona Christi is a validly ordained Priest’. Hence the name ‘minister of the Eucharist’ belongs properly to the priest alone. Moreover, also by reason of their sacred ordination, the ordinary ministers of Holy Communion are the bishop, the priest and the deacon, to whom it belongs therefore to administer Holy Communion to the lay members of Christ’s faithful during the celebration of Mass” (RS, n. 154). Even an instituted acolyte is an extraordinary minister: “In addition to the ordinary ministers there is the formally instituted acolyte, who by virtue of his institution is an extraordinary minister of Holy Communion even outside the celebration of Mass” (RS 155). As regards lay people who distribute Communion the Instruction clarifies the terminology: “This function is to be understood strictly according to the name by which it is known, that is to say, that of extraordinary minister of Holy Communion, and not ‘special minister of Holy Communion’ nor ‘extraordinary minister of the Eucharist” nor ‘special minister of the Eucharist’, by which names the meaning of this function is unnecessarily and improperly broadened” (RS, n. 156). As explained above, only the priest is the minister of the Eucharist, so there are no extraordinary or special ministers of the Eucharist. When the Instruction adds that names like “special minister of Holy Communion” unnecessarily and improperly broaden the meaning of this function, it implies that the use of lay people to distribute Communion should be truly extraordinary, exceptional, not ordinary. When may extraordinary ministers of Communion be asked to exercise their role? The answer is: “only when the priest is prevented by weakness or advanced age or some other genuine reason, or when the number of faithful coming to Communion is so great that the very celebration of Mass would be unduly prolonged. This, however, is to be understood in such a way that a brief prolongation, considering the circumstances and culture of the place, is not at all a sufficient reason” (RS 158). Thus if the priest sits down while extraordinary ministers distribute Communion this is justified if he is ill, elderly or for whatever other reason prevented from doing it himself. Naturally, terms like “unduly prolonged” or “brief prolongation” are not defined in terms of minutes. If the Mass were to be prolonged by 15 or 20 minutes on a Sunday, this could perhaps be considered an undue prolongation and it would justify the use of extraordinary ministers, especially if the Mass is to be followed shortly thereafter by another one. On a weekday a shorter prolongation would justify their use, since some of the congregation will have to go to work or to another important engagement and if the Mass is unduly prolonged they will not be able to attend it at all. Nonetheless, in many parishes the number of faithful in weekday Masses is not such as to require the use of extraordinary ministers. If Communion is distributed under the species of wine as well as of bread, however, lay people will often be required to present the chalice with the Precious Blood. What is clearly a disorder is to have several extraordinary ministers in every Mass as a way of giving lay people an important ministry to perform. As the Second Vatican Council explains, the proper role of the lay faithful is to engage in temporal affairs and order them according to God’s law (cf. Lumen gentium 31), not to engage in liturgical affairs. 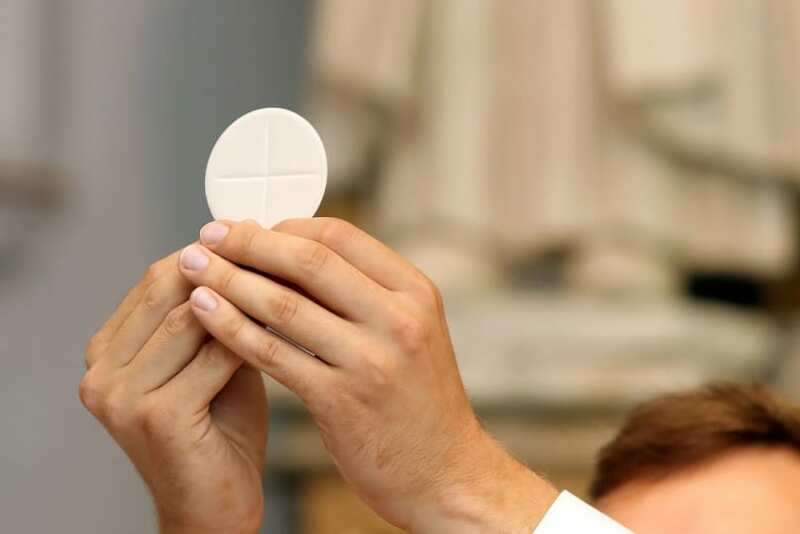 It would also be an abuse if there were other priests or deacons in the parish who were available to distribute Communion but who refrained from doing so by way of giving lay people the opportunity. Likewise, if there were numerous priests in a concelebrated Mass sitting down while lay people distributed Communion. Lay people helping with Communion are a big help in many circumstances, but they should exercise their role only when truly required.